Microwave the peas and carrots a bit to thaw, mix with chicken, soup and milk. Put in sprayed pie plate or 8×8 square glass baking pan. Sprinkle with poultry seasoning. Top with one sheet of the puff pastry, coat with egg wash if desired. 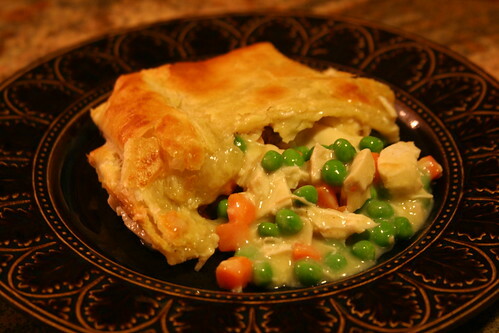 Bake at about 375 for 30 mins or until puff pastry is golden and pot pie part is bubbly. Recipe easily doubles for a 9×12 pan, just roll the puff pastry out thinner to fit. This entry was posted on Sunday, January 31st, 2010 at 11:57 am	and is filed under menus. You can follow any responses to this entry through the RSS 2.0 feed. You can leave a response, or trackback from your own site. Thanks for doing this early!!! Now I can go to the grocery store and copy.